Dave is a senior technology executive who has enjoyed a 30+ year career leading teams and delivering strategic solutions in the Financial Services industry to improve customer and employee experience. 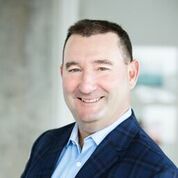 He has a strong foundation in technology and financial services and was recently SVP of Corporate Centre Technology at Canadian Imperial Bank of Commerce, leading teams accountable for Big Data, Agile@Scale, Robotic Process Automation and large scale business transformations in Finance, HR and Procurement. Dave’s teams have leveraged StereoLogic for several large scale business process transformations including a Retail Product Origination re-write across the entire branch network and several Robotic Process Automation initiatives.